Another epitaph cut short by an unfortunate preservation effort. Most of the old stones in Wrentham's Central Cemetery are embedded in concrete strips that keep them in straight, mowable lines. Sadly, many of the epitaphs were cut off when the stones were sunk into the concrete. 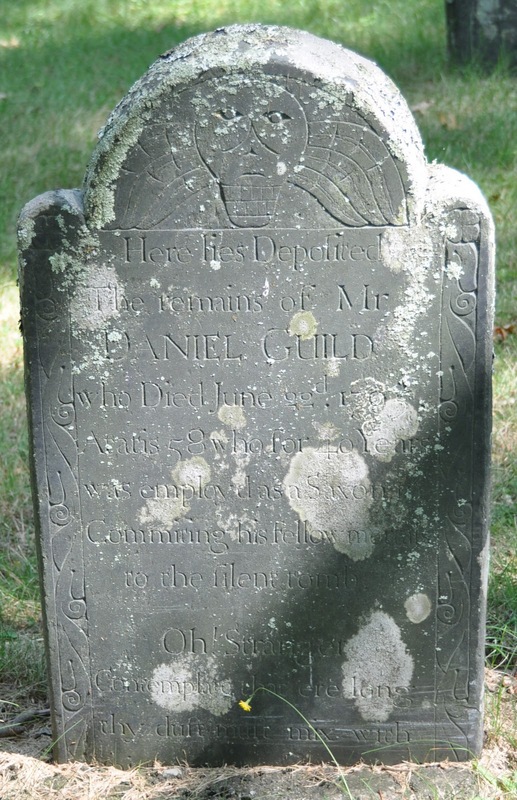 I think that Daniel Guild was probably a sexton, rather than a Saxon, but who am I to nitpick? I always love finding gravestones dedicated to carvers and others who made their livings creating the graveyards in which they were buried. It's interesting to see how they were memorialized. Daniel Guild (or his family) chose a winged skull that was decidedly old-fashioned by 1795. The Fisher/Farrington shop was still producing these stones in the 1790s, but they were not the height of fashion. It's always fascinated me that John Stevens's stone was carved by his younger son William, who split from the family business to start his own, rather than by his heir and successor to the John Stevens Shop, John II. I've always wondered what the story was there.